Scarfolk Council had a few problems with outsiders, or "Scarfnots" as they were known, interfering in town affairs throughout the 1970s, so it developed a scheme to encourage civic discretion. The severity of punishment for a "loose tongue" more or less guaranteed obedience, though a few Black Spot cards were issued. For example, four year old Jeremy Chapped inadvertently discussed with his "Scarfnot" trepanning teacher the sudden, inexplicable appearances of ancient megaliths in schools and community centres, and found himself facing capital punishment. In lieu of this penalty he pushed an unloved aunt in the path of a speeding hovercraft for which he received not only a cub scout badge, but also a £5 book token from the mayor. Is "terms apply" anachronistic? I thought it was pretty much par for the course. "Weekend for two in Guernsey!" What a chilling euphemism. "...for which he received... a £5 book token ..."
Ah, the good old days. 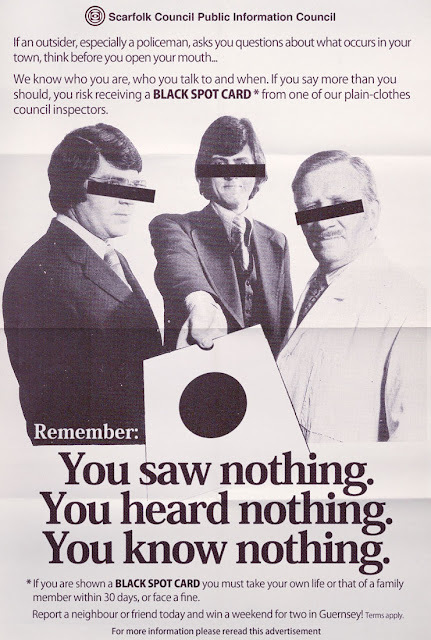 I remember I once received a black spot card for discussing the anachronistic and looping nature of Scarfolk, the first probably due to the latter, with an officer from London who was taking his family on a trip to Scarfolk. I was one of the few people who thought dealing with a fine would be a better punishment than killing a family member. Boy, was I wrong. Never heard from Sergeant Blackwell again, either.